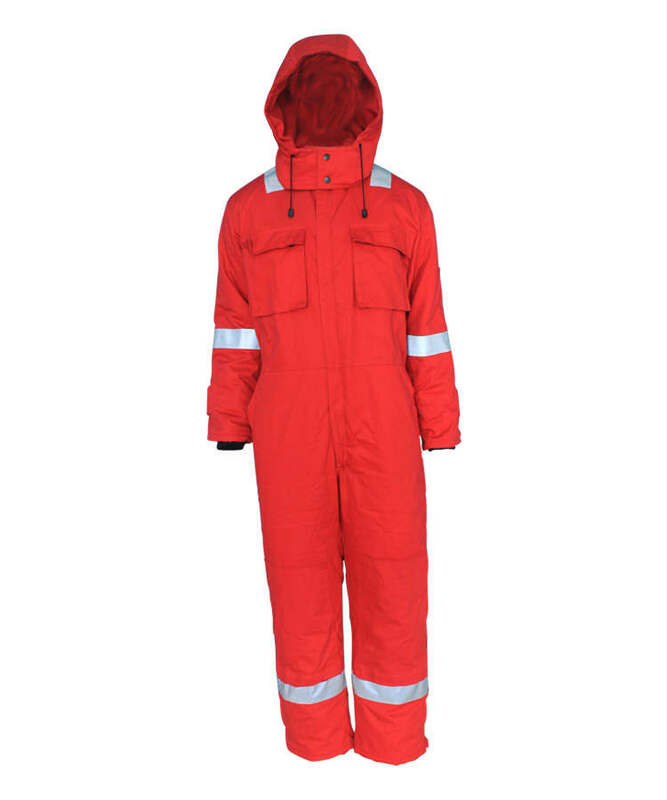 This yellow high visibility coveralls made of 270gsm high visibility yellow fabric, and can meet EN 20471 other standards. The yellow high visibility coveralls can make the wearer be identified more easier than the surrounding things in poor light and short distance, thus to ensure the safety of the wearer. 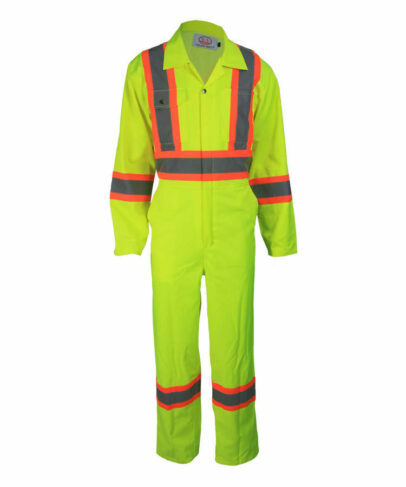 This yellow high visibility coveralls is highly breathable and that a comfortable temperature is maintained at all times. 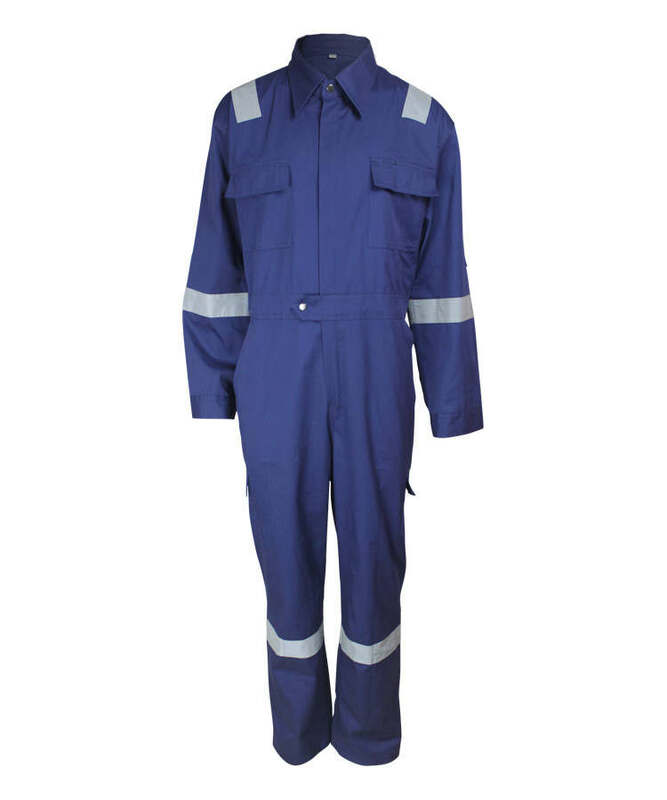 This yellow high visibility coveralls mostly used for policeman uniform, railway uniform, or produce offshore garment and oil gas. 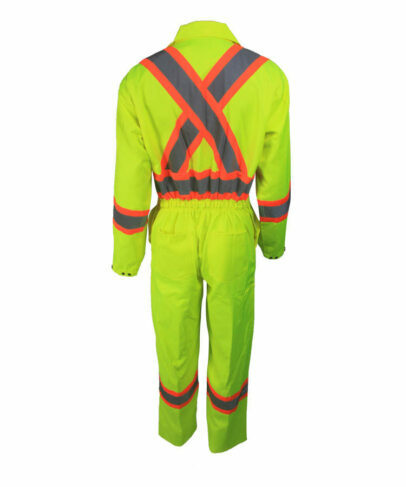 Yellow high visibility coveralls front fly use 5# double X metal zipper to bottom neck, snap button closed. Left and right front breast have one pocket per each, it has flap on left front breast pocket, snap button closed, and can storing some small and easily slipping things. On the cuff, there are two snap buttons for closing, it can be adjusted according to your needs. There are two patch pockets on hips, convenient and practical. 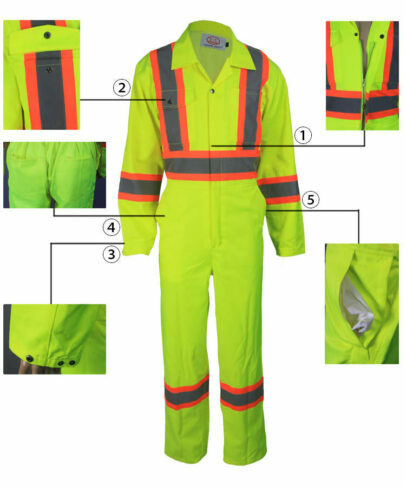 The yellow high visibility coveralls have two slant pockets and vents, your hands can get into the pocket and get through vent, and touch the inner clothing. The back waist elastic can be adjusted according to the wearer’s waist. There is active fold on back side, for conveniently working and acting, wearer will feel comfortable and suitable for body. 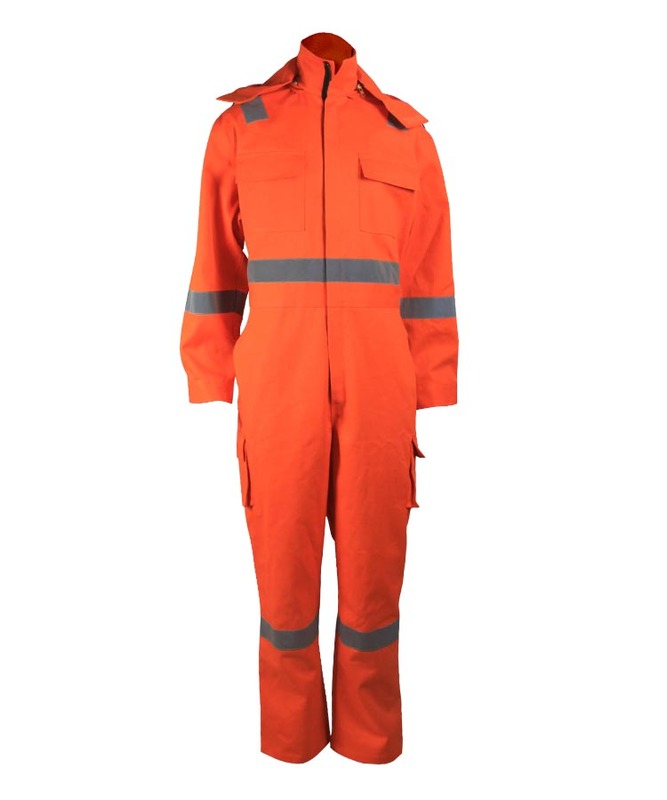 Breast/back/waist/sleeves and legs each have one 5cm non-FR reflective tape and orange contrast color background fabric, make the whole high visibility coveralls being more highlight and conspicuous. Reflective tape is imposed by lines with single visible thread. All the pockets and force bearing point have tacks fixed. 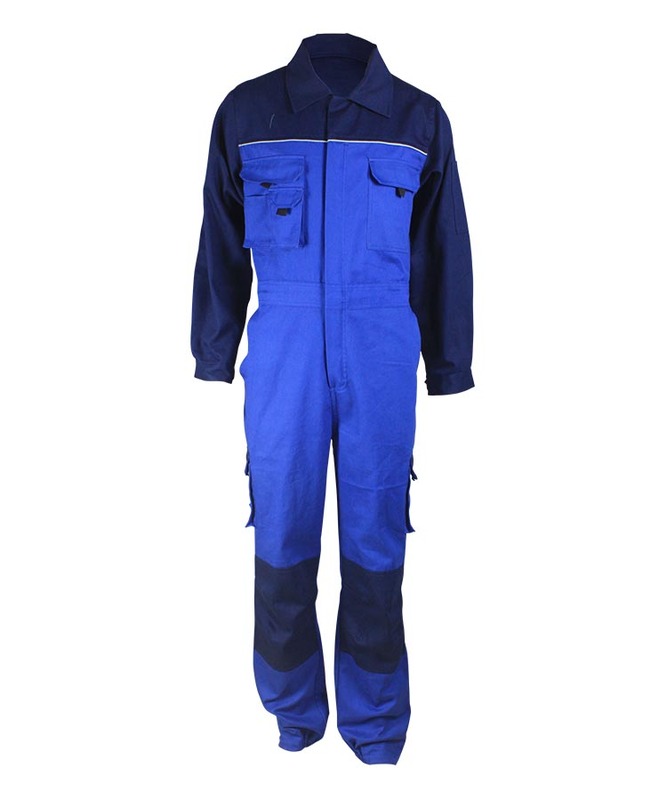 The whole yellow high visibility coveralls, every easily pulling position have imposed by double visible thread, to enhance the firmness on clothing.